Grab your guitar or bass and microphone, plug into the Roland eBand JS-10, and amaze your friends, family, and fans! 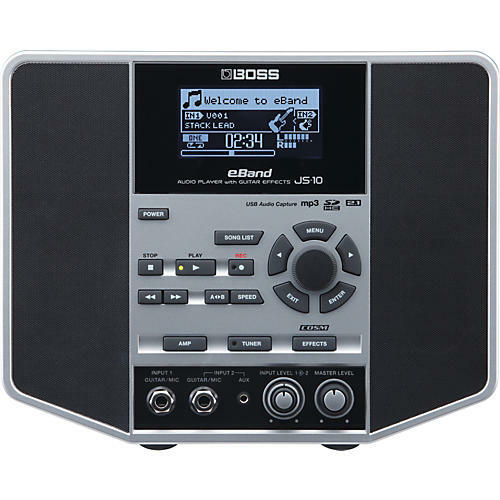 The eBand JS-10 is self contained and small, but fills the room with full-range sound from its 2.1 sound system and pro BOSS effects. Jam with a large selection of onboard song tracks and audio loops, and add your own library of favorite songs to play along with via USB or SD media. You can easily change the tempo and key signature of the songs with high-quality results, and record your performances, too. eBand is the compact, all-in-one jam station packed with pro features and larger-than-life sound. Dimensions (WxDxH): 10.39" x 6.65" x 8.23"